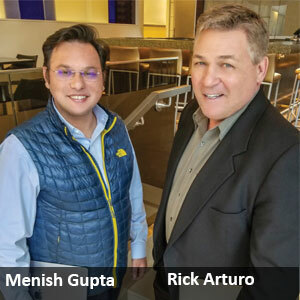 While working as a Director of Information Management in American Express, Menish Gupta witnessed the dynamic changes that new technologies were bringing into the technique of committing fraud, creating more deceitful opportunities and making detection harder. Motivated to prevent crime before it causes massive damages, Gupta went on to found BitBootCamp, a data science training facility. Comprised of knowledgeable experts in financial fraud, BitBootCamp soon became popular among developers trying to understand how data can be leveraged to detect fraud. Although the trainees of the program joined large enterprises, they often approached Gupta for consultations. This led to the establishment of Hudson Data, a data consultancy organization that provides Machine Learning-as-a-Service and data-driven platform development in combination with data training to prevent fraud and deceitful actions across enterprises. Today, though data is the driving force behind every organizational decision, analyzing the accumulating data and creating an actionable plan is one of the biggest challenges that businesses of all sizes face. “We focus on what we term as data ROI. We develop and leverage machine learning models to bring value to the data,” states Rick Arturo, VP of Business Development at Hudson Data. Hudson Data attacks these challenges by deploying “Data Science Pods” consisting of an integrated team of Engagement Managers, Data Engineers, Data Analysts, and Data Scientists to quickly assess, design, build, and implement solutions. “We don’t leave until the customer is satisfied,” Arturo added. The company mainly focuses on the financial and insurance market but has recently extended their offerings to healthcare, retail, pharma, and logistics sectors among others. The Hudson Data team constantly updates their service models to identify the prevalent customer behavior across verticals and provides a data-driven recommendation to prevent fraud. Hudson Data also employs pattern mining on the client’s data to connect similar dots and find any anomalous pattern that might lead to fraud. “Our team collaborates with clients, helps them identify the data needed to analyze a use case, and provides meaningful insights to undertake informed decisions,” says Menish Gupta, CEO of Hudson Data. Arturo shares a case scenario of a large insurance company in search of a solution that would reduce the risk profile of their clients and prevent payouts of fraudulent claims. Hudson Data helped the company identify synthetic IDs, run a background check on the applicants’ profiles, and cross-compare the data available to determine the probability of a fraud claim. Within two years, the company saved millions of dollars and fraud claim risk was considerably minimized. With expertise in graph database modeling technique, the team of Hudson Data understands the uniqueness of each client’s requirements and builds a customized machine learning model. The models are micro-segmented to make it easier for clients to feed the data into the graph database and process it. Furthermore, Hudson Data collaborates with their clients to design an AI roadmap by understanding the use case of its implementation and provides recommendations on the infrastructure— on-premise or cloud—required to support the system accordingly. “We are part of both the design and the implementation process. We help our clients right from partitioning servers to setting up the cloud infrastructure until the main goal of implementing the technology is achieved,” explains Arturo. Hudson Data’s plans for the future include enhancing its graph model, exploring new methodologies in reinforcement learning as well as leveraging open source tools to improve the modeling solution. The company is set to release its Machine Learning Graph Analytics software in Q1 of 2018 which will provide data science teams. Arturo concludes by explaining that they are in the process of combining third-party datasets with their services, which can be leveraged by customers to create an informed decision.